Marketing 2 Edition <>A unique and easy-to-read breakdown of marketing information. 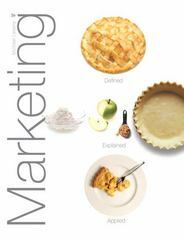 Marketing: Defined, Explained, Applied was written from the ground up to be the most usable reference guide for understanding the principles of marketing. The unique visual and organizational style of the text clearly presents key information that draws readers into the material, allowing them to use their text–rather than passively read it. The second edition features a new format that makes it easier for readers to study and learn the material.